Things slowed down quite a bit in the North Island of New Zealand and we were itching to do something off of the Flying Kiwi bus. 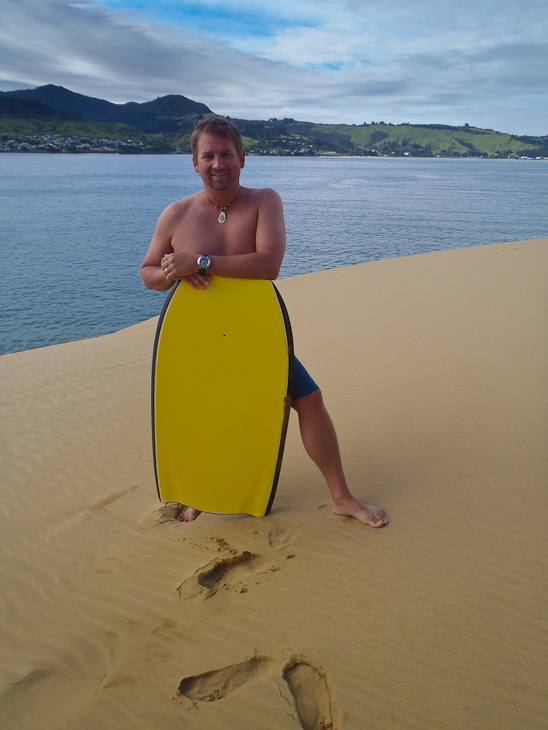 It wasn’t the greatest day outside and the water looked quite cold so we weren’t overly enthusiastic about going sand boarding when we got to Openoni in the heart of Hokianga. But it was on our travel itinerary so we did it. 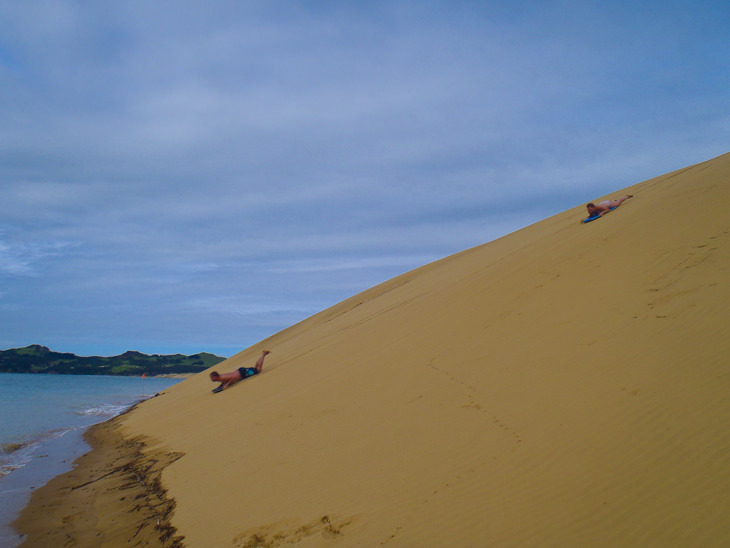 Sand boarding in New Zealand wasn’t even remotely the same as Sand Boarding in Peru. In Peru we strapped a board onto our feet and challenged ourselves as we tried to stand up and make a few curves down the some of the world's largest sand dunes. 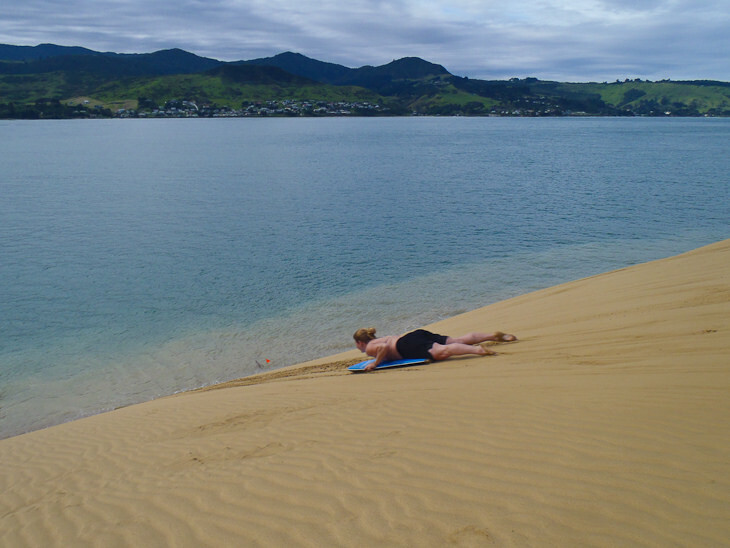 In New Zealand, sandboarding is more like tobogganing or winter sledding down a snowy hill, only here it is on sand. Sand boarding in Openoni which is just south of the Bay of Islands is a good little stop in the middle of a sunny afternoon. 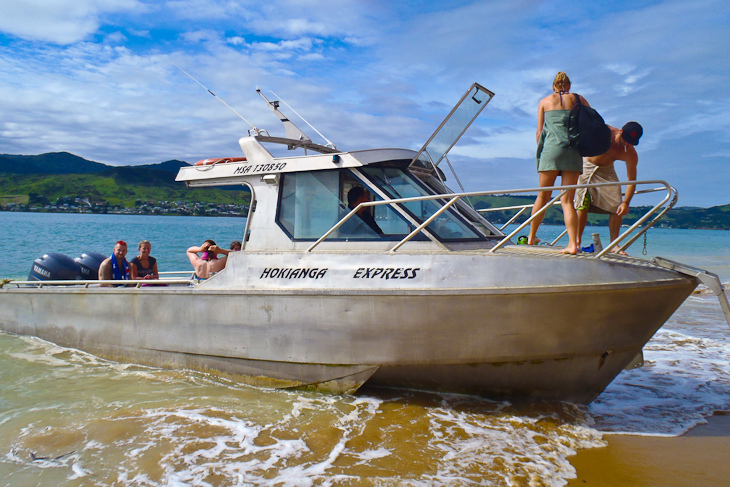 The cost is okay at 20 NZD (about $15 USD) per person for the boat ride and the board rental making it one of the cheapest excursions we did in the country. 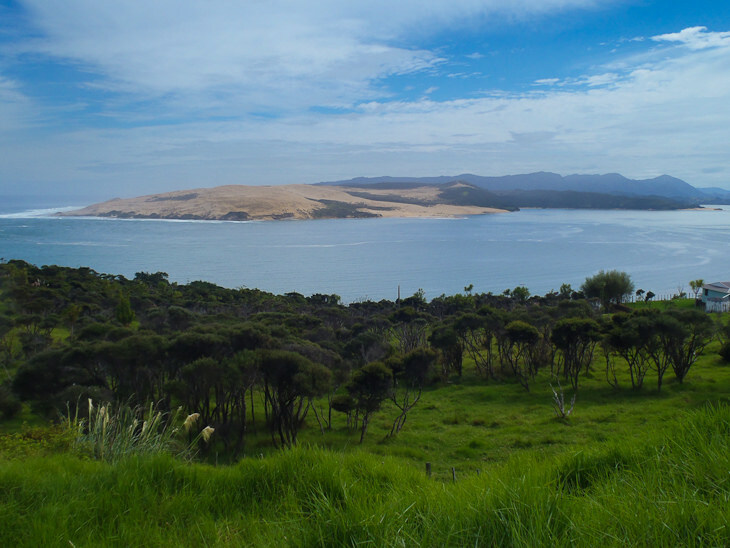 A boat takes you across the bay to the sand hills and supplies boogie boards for you to lay on. You are dropped off at the foot of a dune and then have an hour to get as many runs in as you can. 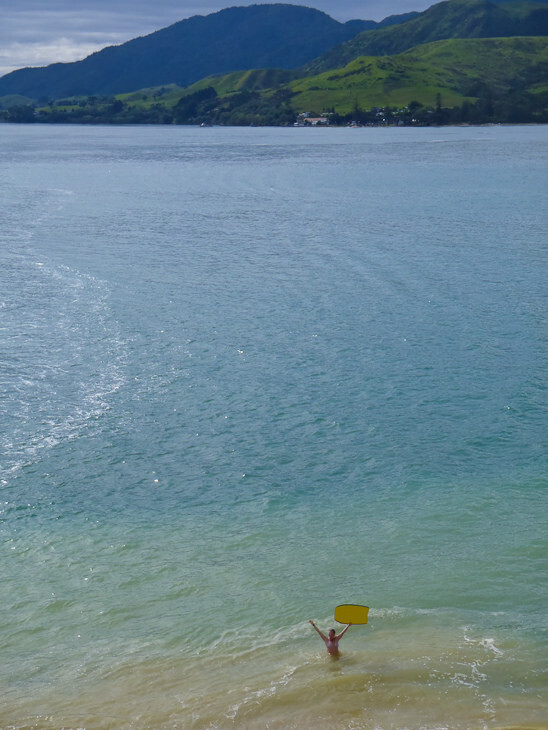 I am not a fan of cold water (as I have said in a few posts already) so having to ride a toboggan down a hill into the cold bay was not high on my list of activities. But everyone was into it, so I better join in. The ride itself was a lot of fun. The sand dune was steep and fast and we whizzed down the hill. The faster you go downhill, the farther into the water you go. Dave joined in with our guide Vinnie had done this several times before and was a sandboarding pro. They jumped on their boards at full speed and flung themselves into a speedy flight. Dave, being a first timer and about a decade older had the best of intentions but gave himself quite a jolt when he hit the water. The impact was harsh and he the board shot up hitting him in the face and jolting his jaw shut in one clenching bite. He put a smile on his face and didn't admit defeat and kept on boarding for the rest of the hour. I took it slower my first board down and put my toes in the sand dragging them along to slow myself down. I didn't hurt myself and was ready for more. Once I did the first run down the hill into the chilly waters I was over my apprehension. I was now ready to have a little fun and could go a little faster and farther out into the bay. The faster you go down the hill, the farther you go into the water. Your board skips across the top of the water and you have a good little ride before sinking into the brisk bay. I Forgot how much Fun Tobogganing Can Be! Everyone got into it, even an older couple that had no intention of sandboarding. They came across on the boat to take some pictures, but once they saw how much fun it was, they joined in too! To find your inner child and have some fun frolicking in the sand, Sandboarding in Openoni was good fun. You will be smiling the day away as you sail down the dunes. The biggest problem was that there weren’t proper facilities to change after the day out in the sand. There were 2 toilets to change in, but they only had very small sinks to try to rinse off a bit of the sand. Needless to say, we were all covered in sand and had to sit on the bus for the rest of the afternoon in a very uncomfortable situation. Sand Boarding was good fun, would I recommend it? If you find yourself in the town of Openoni go for it. If you have to make a detour to get there, give it a miss. It was fun, but not life changing fun. Cost $20 NZD -The Price is right and the timing is good. After an hour, you will have had your fill of sandboarding and be ready to move on to your next destination. For more information on adventure tours of New Zealand Check out the Flying Kiwi. 2 Responses to "Finding our Inner Child Playing in the Sand"
Looks like fun! We tried it on Moreton Island in Queensland Australia. It was fun but a lot of work! I put sunscreen on right before we went, and ended up with a face full of sand I couldn’t get off easily! I’d rather go head first into water then into snow (at a reasonable speed, of course!) That looks like so much fun!